Snippets of Jack: "Why Thank Ye Jack"
It seems as though most of our posts in one way or the other involve Jack the Monkey. Well this one is no exception. But this time we are going to talk about the "actor" who plays him, actually more like actress because the monkey is a girl, acting as a guy. I don't know if you've ever really thought about it much, but that monkey dose A LOT of things throughout the series. 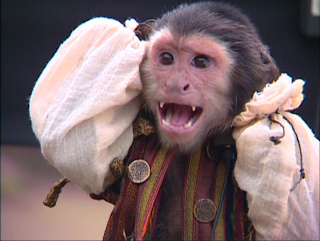 I beleive he is played by different monkeys throughout the series, but this post will be mainly pertaining to Curse of the Black Pearl. 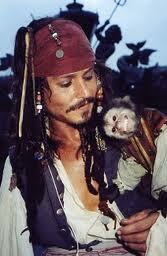 Jack was played by actually two capuchin monkeys, according to IMBD, one was a female named Tara and the other a male named Levi. When you think about it, Jack is actually quite the villian, carrying out all of Barbossa's taks and keeping an eye out for any threats to his master's saftey. Ursula Brauner was the animal trainer for the movie. Geoffrey Rush (Barbossa): "The monkey is actually the smartest person in the film I think because he never looses sight of the gold. Everyone else has human frailty, trial, and jealousy, but the monkey knows we have to get each and every last medallion back into that case." That's rather true, because the monkey is always pointing out helpful stuff that Barbossa or his crew are too dumb to notice. Apparently, monkeys always want to feel safe, which I supppose is dificult sitting on the sholder of a man who is always sreaming or sword fighting. That's the reason for Jack's constant head motions, he's looking around for any sign of danger. So they had to make it every clear to the monkeys that Rush wasn't out to get hikm or boss him around. Rush insisted that the monkey stand on his left sholder (right to the audience) because he beleived that the audience always looks at the screen from left ot right, kinda like a book. Rush wanted to make sure the cute yet evil little monkey did not steal his spotlight, especially when he was in scenes with Keira Knightley (Elizabeth) otherwise he thought he would go completely unoticed! Poor guy. 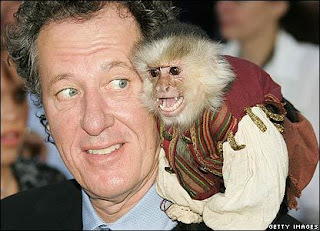 Haha, it's like the monkey is his costar, because he kinda is. Johnny Depp: "I like his work very much. It's, ah, you know he's kinda a runegate." Now, kinda like a child, the monkey can't sit still very long. 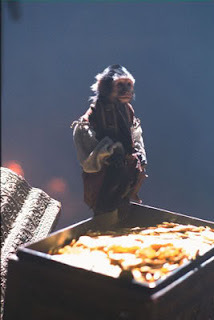 The trainer said that when they have the monkey run around and grab stuff for them, it's actually easier, but making him sit on Barbossa's sholder for a few mnutes as he rambles on is difficult, because they don't want a spazzing monkey to distract from Barbossa's usually creepy or cruel words. Somehow spraying a bit of water on his miniature vest would keep him occupied for the time being. The monkies were rather smart. For example, when we first find out that the monkey's name is Jack (after Captain Jack Sparrow of course), Barbossa thanks the monkey, who coincidentally smiles, as if he understand. How cute yet evil and vicious.